It was a moment of recognition and triumph for 33 sportspersons who received the Rajiv Gandhi Khel Ratna, Dronacharya, Arjuna and Dhyan Chand awards from President A.P.J. Abdul Kalam at an impressive investiture ceremony at the ornate Ashoka Hall of Rashtrapati Bhavan here today. There was an air of bon homie as the sportspersons felt fulfilled for being recognised for their sweat and toil. Many got the coveted awards after many a heart break, but for come, it came as a matter of right. Athlete K.M. Beenamol and shooter Anjali Ved Bhagat shared the Rajiv Gandhi Khel Ratna Award, which carried a cash prize of Rs 5 lakh, while five coaches received the Dronacharya Award, and 21 sportspersons got the Arjuna Award. The Dhyan Chand Award was bestowed on five veteran sportsmen. The Dronacharya and Arjuna Awards carry a cash prize of Rs 3 lakh each while the Dhyan Chand awardees walked away with Rs 1.5 lakh each. Guru Nanak Dev University, which received the Maulana Abdul Kalam Azad Trophy for the best sports university, got Rs 2 lakh as cash prize. Coaches Renu Kohli (athletics), Jaswant Singh (athletics), M.K. Kaushik (hockey), E Prasad Rao (kabaddi) and Cdr.H.D. Motivala (yatching) received the Dronacharya Award. The recipients of the Arjuna Award were Anju Bobby George (athletics), Alok Kumar (billiards and snooker), Ali Qamar (boxing), K. Sasikiran (chess), I.M. Vijayan (football), Shiv Kapur (golf), Gagan Ajit Singh (hockey), Ram Mehar Singh (kabaddi), Anwer Sultan (shooting), Suma Sidharth Shirur (shooting), Mantu Ghosh (table tennis), Ravikant Reddy (volleyball), Thandava Murthy Muthu (weightlifting), Palwinder Singh Cheema (wrestling), Nitin Mongia (yatching), Mamta Kharab (hockey, women), Virender Sehwag (cricket), Saraswati Saha (athletics), Inder Pal Singh (rowing), Sujeet Maan (wrestling) and Ramesh Tikaram (badminton and athletics in the handicapped category). The five veteran sportspersons who received the Dhyan Chand Award were Ram Kumar (basketball), Dharam Singh Mann (hockey), Charles Cornelius (hockey), Om Prakash (volleyball) and Smita Shirole Yadav (rowing). 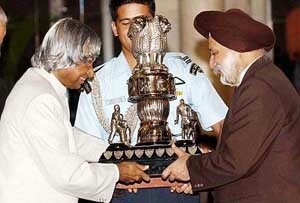 That hockey was the chosen sport, and most popular too, became evident when Gagan Ajit Singh was welcomed with a thundering ovation when he walked upto the President to receive the Arjuna Award. In comparison, cricket star Virender Sehwag got a lukewarm response. There were five awards for hockey—one Dronacharya, two Arjuna, and two Dhyan Chand winners. Charles Cornelius, who won the Dhyan Chand Award for Life Time Achievement in Sports and Games, was elated at this belated recognition for his immense contribution to hockey, though he said wistfully that he should have got the Arjuna Award way back in 1975. Charles, who played all his hockey for Punjab, was one of the finest goalkeepers the country had produced. But ill-luck befell on him during the final coaching camp for the Teheran Asian Games in 1974, when he suffered an injury on the field and improper medication resulted in immobilisation of his. He played hockey never after, and a brilliant career was short at the prime. But the powers that be in hockey then did not deem it fit to recommend his name for the Arjuna Award. The institution of the Dhyan Chand Award in 2002 has come as a boon for those forgotten sportspersons like Charles Cornelius and Dharam Singh Mann, who have finally been rewarded for their selfless service to sports. In the case of hockey Olympian Dharam Singh Mann, the honour has come 45 years too late, but he too was not complaining as he felt that “it was better late than never”. It was also heartening to see a former volleyball international Om Prakash being honoured with the Dhyan Chand Award, which was some consolation for missing out on the Arjuna Award when he was at his peak. 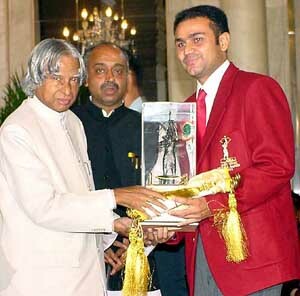 For hockey Olympian Maharaja Kishan Kaushik, the wheel turned full circle when he received the Dronacharya Award. It was ironic that he got the award after he became the coach of the women’s hockey team, though the honour should have come to him when he guided the men’s team to gold at the Bangkok Asian Games in 1998. But on return from Bangkok, he was summarily dismissed from his job, but the Dronacharya Award has reaffirmed his faith in natural justice. The Guru Nanak Dev University of Amritsar created a record when it received the Maulana Abul Kalam Azad Trophy for sporting excellence for the 17th time. They had last won this coveted trophy in 2000-2001. Long jumper Anju Bobby George, who is now competing in the World Championship, boxer Ali Qamar and rower Inder Pal Singh were not present to receive their Arjuna awards in person. Dronacharya awardees Jaswant Singh and Motivala were also absent. Cue sports specialist, national snooker and billiards champion Alok Kumar, never expected to win the coveted Arjuna Award after his name was relegated to the “reserve” category in the second list forwarded to the government by the selection panel following the government’s advise to prune the list.